Structure: Last, First M., and First M. Last. 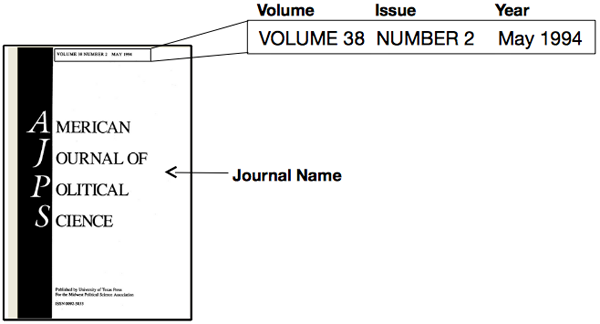 “Article Title.” Journal Title Series Volume.Issue (Year Published): Page(s). Print. Citation: Jacoby, William G. “Public Attitudes Toward Government Spending.” American Journal of Political Science 38.2 (1994): 336-61. Print. Structure: Last, First M. “Article Title.” Journal Title Series Volume.Issue (Year Published): Page(s). Website Title. Web. Date Month Year Accessed. <URL>. Citation: Ashok, Savitri. “Gender, Language, and Identity in Dogeaters: A Post Colonial Critique.” Postcolonial Text 5.2 (2009). Postcolonial Text. Web. 23 Apr. 2010. Structure: Last, First M. “Article Title.” Journal Title Series Volume.Issue (Year Published): Page(s). Database Name. Web. Date Month Year Accessed. <URL>. Citation: Jacoby, William G. “Public Attitudes Toward Government Spending.” American Journal of Political Science 38.2 (1994): 336-61. JSTOR. Web. 23 Apr. 2010. <http://www.jstor.org/stable/2111407&gt;. 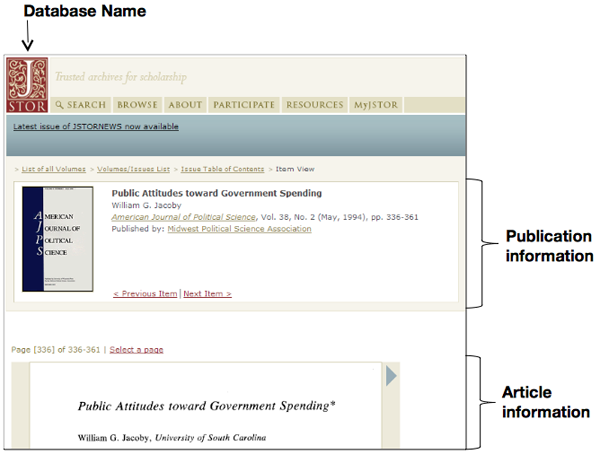 View additional citation examples on how to cite a journal in MLA format.